The theatreosphere has been up in arms in what is being called “Twittergate”. 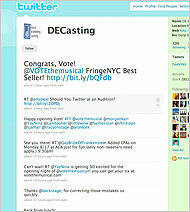 It is focused around casting director Daryl Eisenberg, who was making comments about actors’ auditions during an EPA of New York Musical Theatre Festival’s “Gay Bride of Frankenstein.” She has been twittering about previous auditions, but this one seemed to go public once over 200 people notified Broadwayworld.com’s “Twitter Watch“. The story got big enough that it was covered by The New York Times’ ArtsBeat. The heightened exposure drew response from the producer Billy Butler, composer Marc Shaiman, and casting director Paul Russell. I think Russell’s blog post was the most insightful observation from all that was written. From reading his book and blog, what I appreciate about Russell’s perspective is that he is honest and does not hold back, while at the same time is able to care for the process and rigor actors, and all entertainment professionals, go through while working in a hard business. Actors deserve better treatment from those behind the audition table. I was once an actor. I have a great empathy for them. I donâ€™t know if you Ms. Eisenberg were once an actor. If so; you should be damned ashamed of how you have treated those who now stand where you once stood. If you never had the displeasure of auditioning consider yourself fortunate that you never had to endure what actors in your audition room experienced this past week. I find Mr. Russel’s comment disingenuous, and in reading the tweets myself, I can’t say that it was at all shocking. Had the Casting Director in questions actually mentioned names of the actors in the tweets, then this would have been a huge issue. However, stating that someone doesn’t ‘look like their headshot’ in a tweet isn’t blasphemy. It’s the musings of a frustrated casting director who is fed up with what he or she is seeing on stage and in front of them. What I find odd is Russel shares CD stories and admits to it, but then goes on to say he’s excused because he is using them a ‘teaching tool’. That in and of itself is hypocritical. One could examine these tweets as a “How Now To Audition” section and learn from it. Putting your own disclaimer up prior to posting your blog or your book doesn’t excuse you from ‘breaking the trust of the room’. I on the other hand don’t find this to be a ‘breach of trust’ in anyway shape or form. CD’s often gossip and share horror stories. They ca be a catty bunch, they can also be an incredible example of professionalism. However, given how much tech makes it in a room these days, This was bound to happen.